This buildings on this block of Campbell between Manheim and E. 39th Streets look much the same as they did when they were built after the turn of the 20th century. As Thanksgiving approached in 1927, it’s a pretty good bet that Effie Kauffman of Central Hyde Park was working on her holiday planning. Mrs. Kauffman’s prize-winning Thanksgiving menu was shared in the Nov. 22 Kansas City Star that year. It included a grapefruit cocktail, turkey with oyster dressing, peas in cream, leaf lettuce with Thousand Island dressing, and, of course, pumpkin pie for dessert. That fact is among the available history of the block from Harrison to Campbell, Manheim to E. 39th, now considered part of the Central Hyde Park neighborhood. The area grew quickly between 1900 and 1920, filling in with extended families that included preachers, teachers and car dealers. The homes were large and “modern,” by early 1900 standards. The home at 3809 Campbell, for sale in 1909, was eight rooms, made use of quartered oak, with an exterior of Warrensburg cut stone. The Piggly Wiggly Grocery named Effie Kauffman’s Thanksgiving menu that best of 1927, and shared it in this ad that highlighted Thanksgiving groceries that year. As part of our Uncovering History Project, the Midtown KC Post is taking a look at each block in Midtown, including a set of 1940 tax assessment photos which is available for many blocks. (Many people seem confused by the tax assessment photos, which all include a man holding a sign. Here’s the story behind them). Unfortunately, the Kansas City Public Library does not have the 1940s photos from the block from Harrison to Campbell, Manheim to E. 39th. 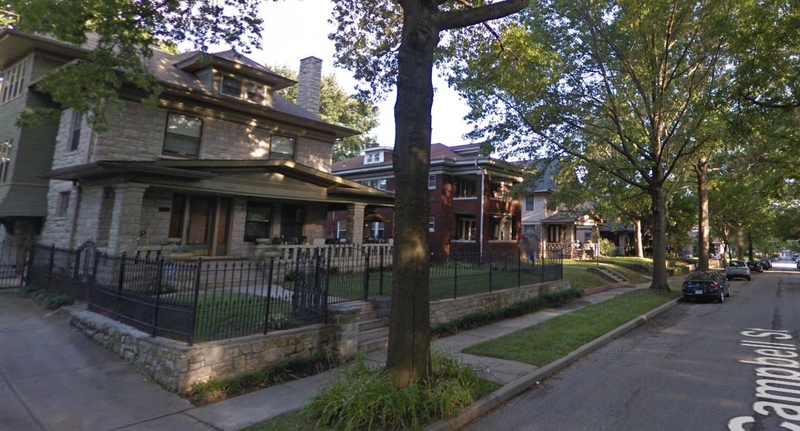 The Neels of 3820 Harrison were among the prominent familes on the block in those early years. The Rev. Samuel Neel was pastor of the Central Presbyterian Church from 1888 to 1912. His father was an elder in a Fayette County, Tennessee Presbyterian Church and owner of a large plantation there. Samuel joined the Confederate army in the Civil War, fighting in several battles before being wounded and captured. He was released near the end of the war. He later studied in Scotland and Germany before becoming a minister in Mississippi and Kentucky. Neel came to Kansas City in 1888 to preach at the Central Presbyterian Church at Eighth and Central. He also established a mission near Fifth and Lydia. Records show his son, Ellison Neel, living next door at 3824 Harrison until 1922. Rev. Neel and his wife both died in 1921. Another Presbyterian minister, retired Dr. I.F. Swallow, lived on the block at 3801 Campbell in the 1920s. Several teachers made their homes on the block. Louis and Frank Tuton, both teachers of mathematics, boarded with the Evan Hosier family at 3838 Harrison. Hosier, a retail jeweler, lived there with his wife Edith, son Abram, and mulatto servant Zelia O’Rear in 1910. Next door at 3840 Harrison, teacher Ethel Chapman lived with her mother, a widow, a sister and a brother in 1910. And the Kirtley family, at 3828, also included three teachers that year. Several families listed in that census in 1910 had live-in servants, often black or recent immigrants. The Neel family had a white servant named Bessie Turner. Edwin Moss, a 19-year-old mulatto servant worked for the Kirtleys, and the David B. Fant family at 3815 Cambell employed mulatto servant Georgia Branham. In 1938, Witwer spoke on behalf of other property owners on Harrison: they hoped the city would rezone the 3800 block of Harrison to allow use as apartments. Many Midtown homes were converted to apartments during this period of housing shortage. In a petition filed with the city, 20 of the 24 owners said both sides of Harrison were occupied by 2½- and 2-story residences that owners wanted to be allowed to convert into 4-apartment buildings. Historic photos courtesy Kansas City Public Library/Missouri Valley Special Collections. Do you have memories or more details about this area of Midtown? Please share them with our readers. Would you like us to focus on your block next week? Send us an email. Our book, Kansas City’s Historic Midtown Neighborhoods, is available now at local bookstores and on Amazon.com. Let us know if you want us to come to your neighborhood association or organization’s meeting to share what we’ve learned about Midtown neighborhood history and tell your members how they can help preserve Midtown history. A 1909-1950 Sanborn Fire Insurance Map of the block.